Visit the former home of Frank R. Dickinson (1874-1961), artist, designer and craftsman, who built his house in the English Arts and Crafts style between 1902-4, following the teachings and philosophies of William Morris and John Ruskin. The result is a unique blend of traditional and Art Nouveau, which has featured in several recent television series on architectural history. Inside the Grade II* listed interior are his hand-made furniture, paintings, interior decoration, carvings and metalwork, which still inspire visitors today. With very limited financial resources Dickinson actually built the house and its furniture himself – the ultimate in D.I.Y. ​Little Holland House opens on the first Sunday of each month 11:00-17:00. No booking is required. Admission is free and donations are welcomed. Visitors may arrive by train at Carshalton Beeches (3 minute walk, and not to be confused with Carshalton). Bus route 154 passes the house, and passengers should alight at Carshalton Beeches Station and walk up the hill away from the railway; Little Holland House is on the left hand side of Beeches Avenue. If travelling by car Little Holland House is located on the B278 (no off-street parking). For further details call 020 8770 4781. Wheelchair access: the building has an exterior front step, but the ground floor interior is all on one level. We regret there are no disabled toilet facilities. Due to the fragile nature of the interior at the moment we are unable to welcome children’s buggies. ​Unfortunately, due to the delicate nature of Little Holland House’s building and objects, we are unable to allow dogs entry onto the premises with the exception of service dogs. Enjoy a special visit to this unique house accompanied by a guide. A chance to make yourself at home and spend time in the extraordinary decorative interior of the house. Discover some of the sources that inspired Frank Dickinson’s creativity. Tickets are £6.50 including tea, coffee and cake. Please see HERE to book - places are limited. Former home of artist, designer and craftsman Frank Dickinson (1874-1961). A unique interpretation of the English arts and crafts movement, the Grade II* interior was created entirely by Dickinson and contains Dickinson’s paintings, furnishing, metalwork and carvings. Wheelchair access to the ground floor. Florence Dickinson was a skilled needlewoman. See the bedroom curtains and collar that she embroidered. Members of the Honeywood Embroidery Group will be demonstrating their stitching skills 14:00-17:00. Free, drop in. 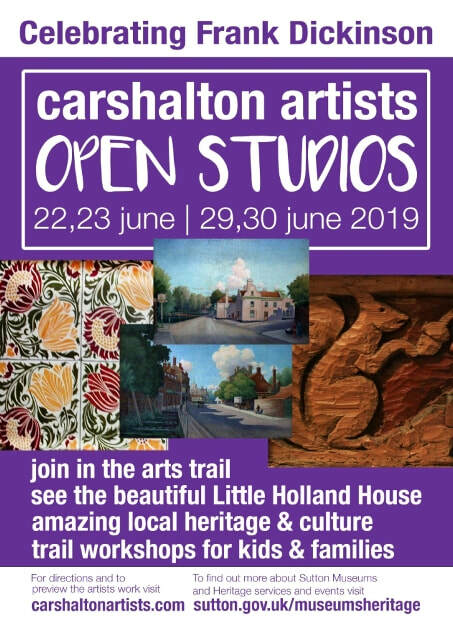 Carshalton Artists Open Studios will, in 2019 celebrate the work of Carshalton Arts and Crafts artist, Frank Dickinson. Dickinson built and then made the stunning interiors of the Grade 2 listed Little Holland House. ​Sutton Museums and Heritage will collaborate with CAOS and will open Little Holland House for all four days of the CAOS festival. We are researching the Little Holland House garden with a view to restoring the layout as far as possible to Frank and Florence Dickinson’s Arts and Crafts design. We would be very grateful to anyone who may have photographs of the front or back areas or any information to get in touch. If you are interested in gardening or garden history, and would like to be involved in this fascinating project please join our great garden volunteer team. 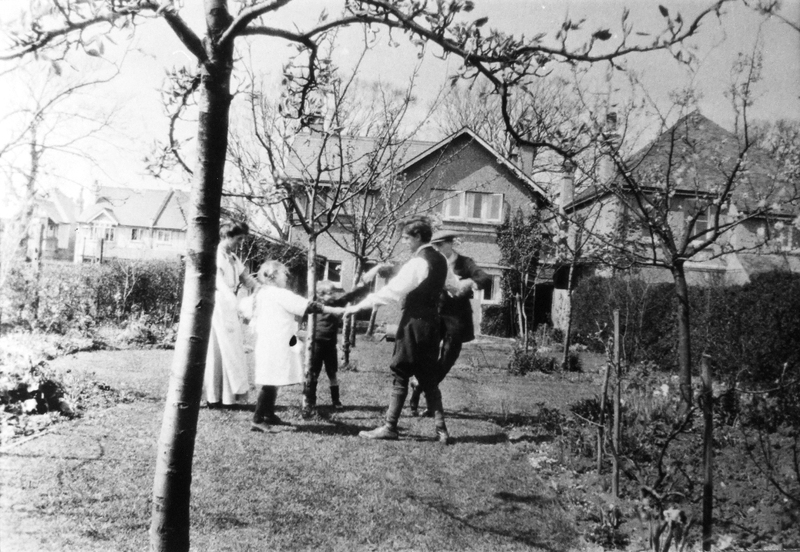 Frank, Florence and their children Julie and Gerard in the garden around 1910. The second man is probably one of Frank’s brothers. Courtesy of LB Sutton Local Studies Collection. 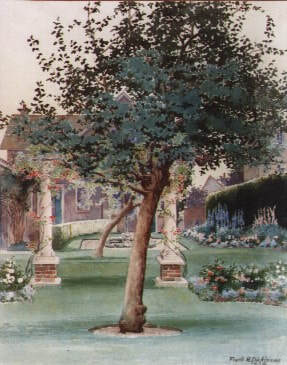 A painting by Frank Dickinson showing the back garden in 1936. Courtesy of LB Sutton Museum collection.